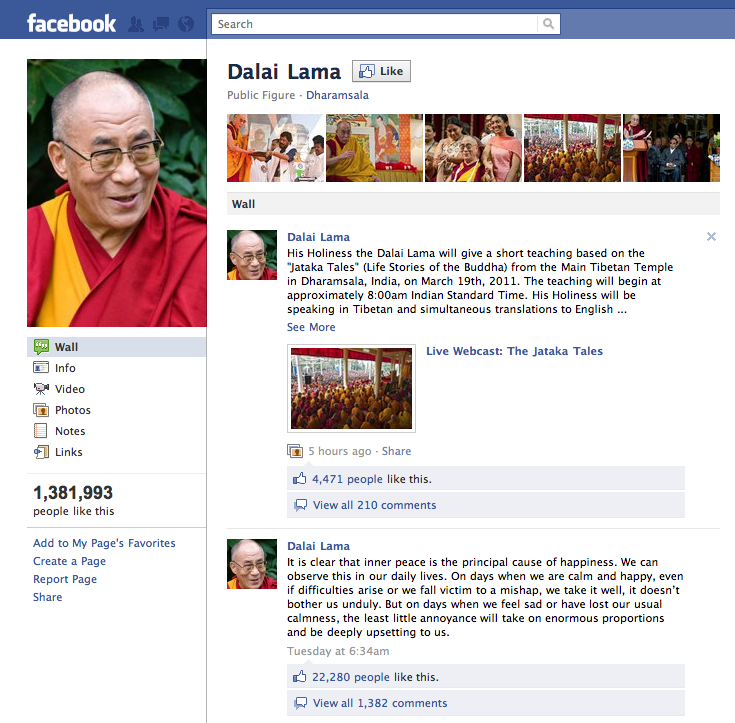 The Dalai Lama is on facebook?! Yeh, he really is. And thanks to my friend Gail who liked his page I know that because it came up in my recommend section. I clicked on the page and found out that 8 more of my friends liked it too (you know who you are). So how do we feel about his? I mean, why not, right? 600 million people can’t be wrong and 1,387,251 of them have actively liked his page. Imagine how many like him off facebook. I love that his location is listed as Office of His Holiness the Dalai Lama. I don’t know, I just never thought of him as having an office. The whole thing seemed sort of odd to me at first but then when I thought about it, isn’t social media fully aligned with his teachings. And hey, where else can you connect with so many with such little effort. And I thought being followed by Jesus and Moses on twitter was a big deal!